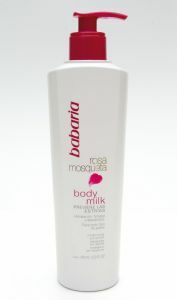 This wonderful lightly fragranced Rosehip Oil Body Milk has been developed by Babaria to complement our range of body moisturisers. This intense body milk is rich in essential fatty acids, omega 3, 6 and 9 it is easily absorbed into your skin leaving an instant feeling of skin firmness and lift. Rosehip Oil comes from an Andean wild rose and has been a beauty secret of the Chilean women for centuries. The rosehips of this unique flower of the Rose family are exceptionally high in Essential Fatty Acids renowned for their regenerating, hydrating and anti-inflammatory properties and their role in repairing damaged skin. Research has shown Rosehip Oil to have remarkable results when applied to sun damaged skin as well as stretch marks and post-operative scars. For Maximum results Massage into the skin twice daily. This new body milk is light non greasy and is the perfect solution to keep your skin perfectly hydrated and moisturised all day. • Rosehip Oil in this body milk actively maintains the skins moisture content and helps to minimise scars, stretch marks and blemishes. • Use as an all over moisturiser. Aqua, Parafinium, Liquidum, Isopropyl Myristate, Stearyl Alcohol, Cetyl Alcohol, Prunus Amygdalus, Dulcus Oil, Ceteth-24, Rosa Moschata Seed Oil, Dimethicone, Tocopheryl Acetate, Phenoxyethanol, Parfum, Methylparaben, EDTA, Tetra Sodium, Citric Acid, BHT, Methylchloroisothazolinone, Sodium Carbomer, Ethylparaben , Butylparaben, Methylisothiazolinone, Propylparaben, Benzyl Salicylate, Citronelloi, Eugenol, Hexyl Cinnamal, Butylphenyl, Methylpropional, Linalool, Alpha- Isomethyl Lanone.